Stoke City can challenge for a top-five place in the Premier League this season, according to their former midfielder Alan Hudson. The Potters have finished ninth in each of the past two seasons. They have made eight summer signings, including Dutch winger Ibrahim Afellay and England defender Glen Johnson. "So many teams are in transition, I don't think Stoke are too far behind the top three and every year they're edging forward," said Hudson, 64. "I don't see any reason why they can't be fourth or fifth." Hudson made nearly 150 appearances in two spells for the Potters in the 1970s and '80s, and won two England caps. Stoke go into the new campaign looking to build on their best points tally of 54 in a Premier League season and, in the process, reduced the gap to the European places from 19 points in 2013-14 to six. And they are still hopeful of adding to their squad before the end of the transfer window, having sold goalkeeper Asmir Begovic to Chelsea and midfielder Steven Nzonzi to Sevilla. 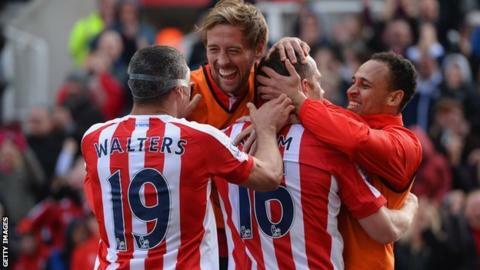 "It's incredible how they keep getting there," former England international Hudson, who also played for Chelsea and Arsenal, told BBC Radio Stoke. "Stoke have done it in a nice quiet way, signing the right players at the right time."